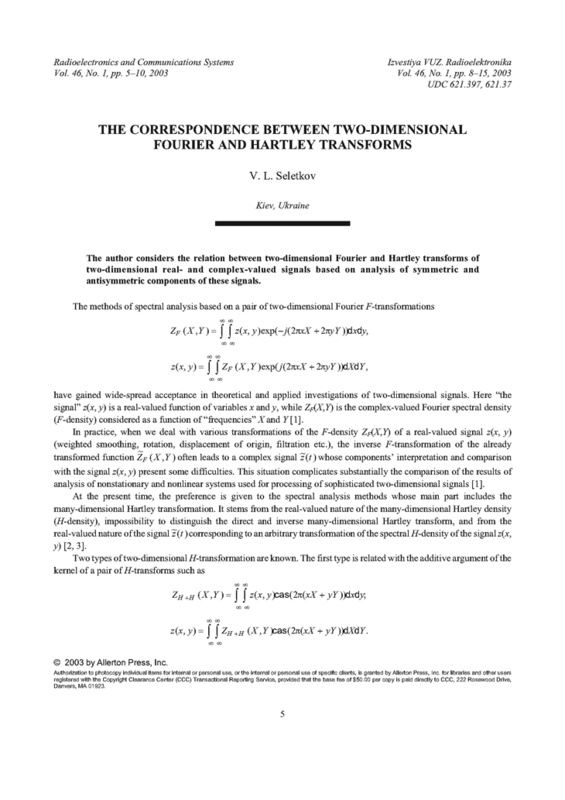 The author considers the relation between two-dimensional Fourier and Hartley transforms of two-dimensional real- and complex-valued signals based on analysis of symmetric and antisymmetric components of these signals. DUDGION, D.E. ; MERSEREAU, R.M. Multidimensional Digital Signal Processing. Prentice-Hall, 1984. SELETKOV, V.L. "Modified Hartly transformation," Izv. VUZ. Radioelektronika, v.40, n.1, p.75-77, 1997. BENDAT, J.S. ; PIERSOL, A.G. Random Data. Analysis and Measurement Procedures. Wiley & Sons, 1986. SELETKOV, V.L. "Version of spectral representation of polarized signals," Izv. VUZ. Radioelektronika, v.39, n.3, p.71-73, 1996.